Futureman, and a side view of the Planet Whizbang hat. Futureman was with us last week for a mere 4.5 days. We had not seen him for six months. He just turned four. It was a short but sweet visit. This only grandchild (for now) came to us wearing a Detroit Tigers hat, which was apparently pretty special to him. 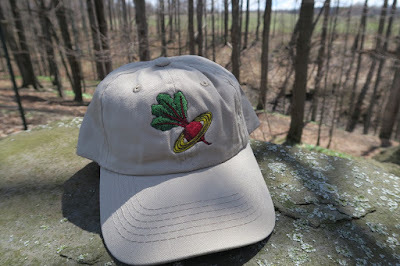 On day two of his visit I showed him my hat with the Planet Whizbang Logo and said, "See, it's a beet.... with golden Saturnal rings." His reply surprised me... "I like beets." I wasn't sure I heard him right. "What did you say?" To which I replied, "Oh, what a dear boy you are!" 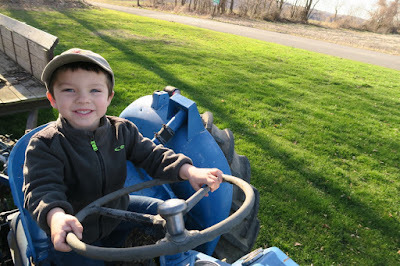 So I asked him if he wanted a beet-hat like Grampie's (he now calls me "Grampie," instead of "Boppy"). He shook his head no and informed me. "I have Tiger hat." Well, on the morning of day three, seeing an extra "beet-hat" on the table next to where he and I were sitting, I adjusted it to fit him and put it on his sweet little head. It stayed there for the rest of the visit. In this picture you can see Futureman with that ridiculous "tiger hat" of his. 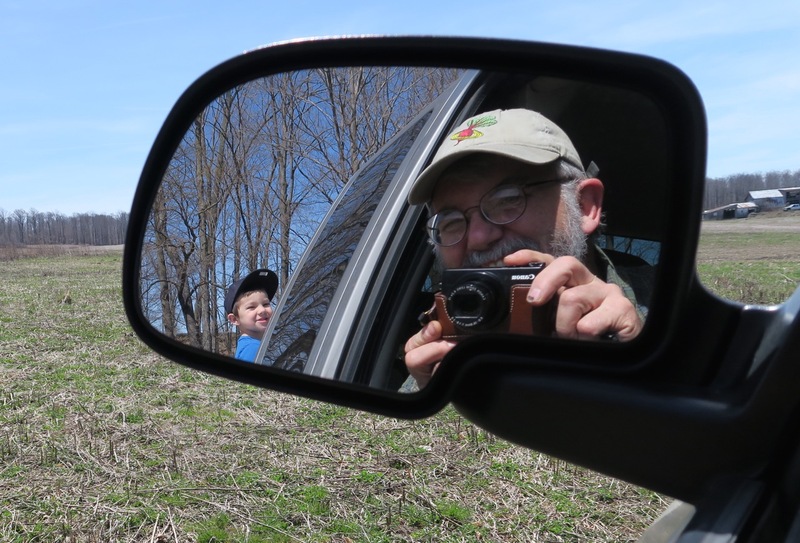 The old codger with the camera is me. We are driving through my field. All little boys love to ride in the back of a pickup through a bumpy field on a sunny spring day. Here we are sitting in 12A, the old New Idea manure spreader I restored to a wagon back in 2012 (I have cropped the old codger out of the picture). This gives you a nice view of the embroidered Planet Whizbang logo. 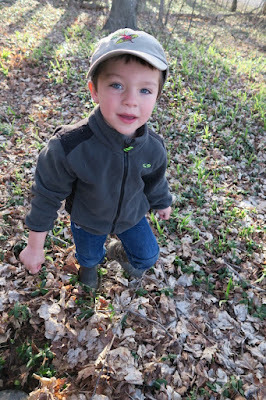 Here you can see the hat worn with a stylish twist. We don't want the brim too far too the side. And we certainly don't want the brim aimed backwards! Hmmm. Here we see the juxtaposition of age and youth, which is both frightening and delightful. And a little bit of the hats. Another juxtaposition shot. 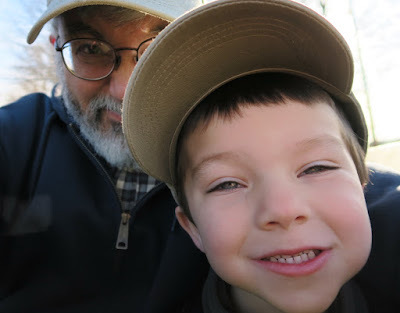 The codger isn't so frightening when he smiles. I'm tipping Futurteman's brim down so the logo can be seen. This is a truly happy child. Wearing a Planet Whizbang hat will do that. 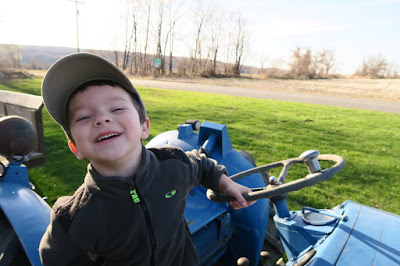 Sitting on Grampie's tractor helps. And here I have captured a moment of pure joie de vivre. 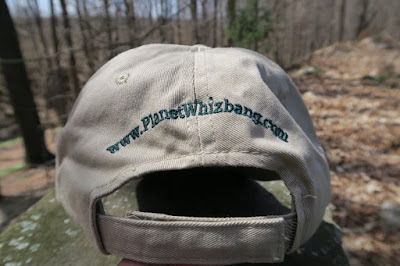 This is a front view of the official Planet Whizbang hat that you can purchase today. It is a one-size-fits-mostl hat. Click the picture to see a larger view. This is a back view. Velcro strap closure. 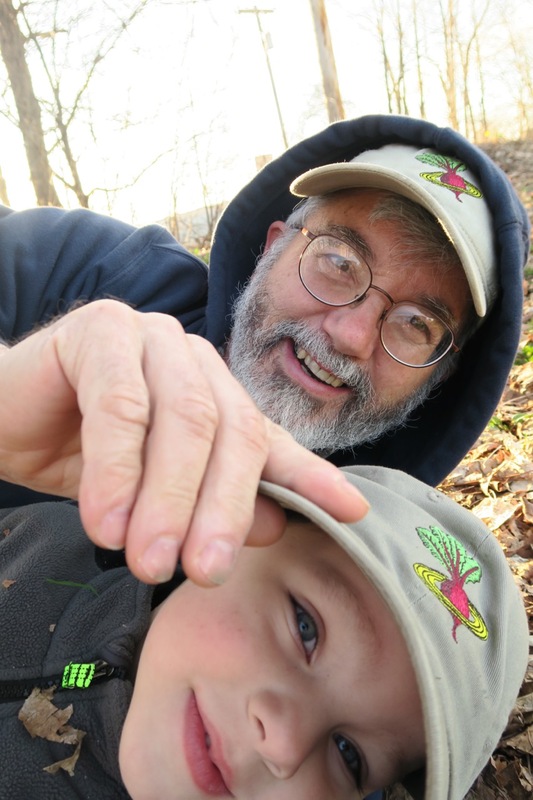 David the Good sporting a Planet Whizbang hat! 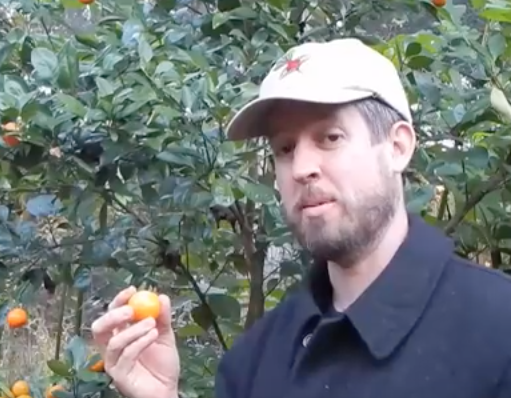 Imagine my surprise when I saw the famous Florida gardening guru, David Goodman, wearing a Planet Whizbang hat in his Marmalade and Campari YouTube Video. But I was even more surprised when he actually took a moment to show off his Planet Whizbang hat in his video titled Larry's $150 Chicken Tractor. Very nice! 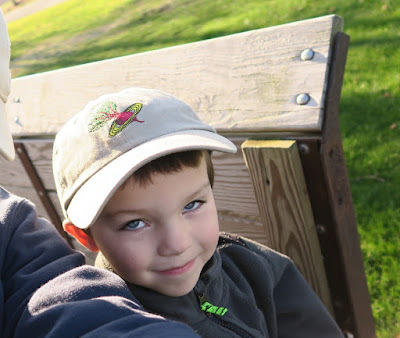 looking very sharp in his Planet Whizbang hat. 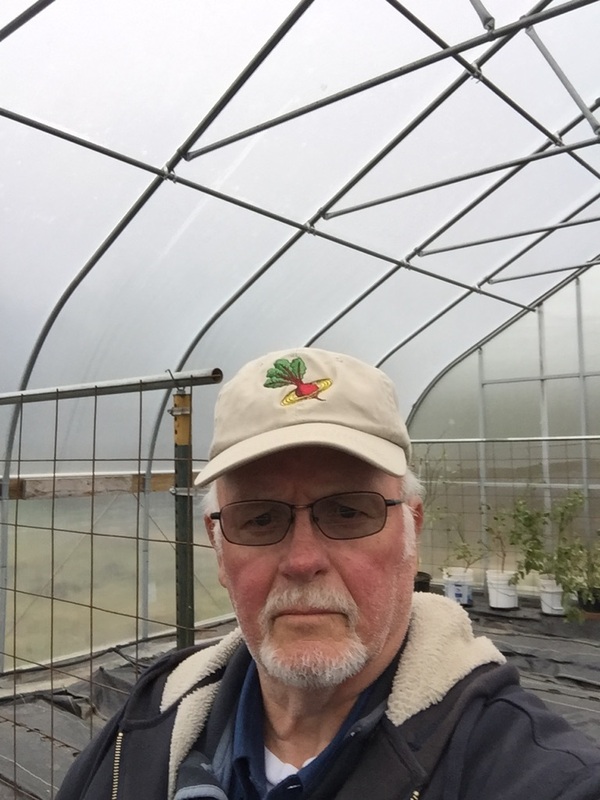 The perfect attire for greenhouse gardening. And there's a Planet Whizbang Trellis Span in the background! I hate to say this, but I was a bit disappointed when I saw it was a regular old baseball cap with a Planet Whizbang logo. When I read "Whizbang hat" I expect some extra nifty features like a place to store a pen or hold a flashlight hands-free. The velcro strap is a nice touch, though, because I find most "one-size-fits-all" caps don't fit me, since I have a fat head. Sorry to disappoint you. It's just a simple hat with a nicely embroidered logo. If you're an adult with a lot of brain capacity, the hat will look small on you. I think it might be considered low profile. I thought it was on the small side when I first tried it on, but now that I have one that is sweat-stained and otherwise properly soiled and broken in, I like it much more. In fact, I've grown quite fond of it. It does a good job of shading my eyes when working outdoors, and that is as it should be. Then, when I come indoors to nap in my recliner, I can readjust the hat over my face and it is sort of a 'lights out" device. I really like your idea of accessorizing the hat. That gives me some ideas. Hands-free flashlight holder? Excellent. (that reminds me of the Toe-Tapper faucet switch I developed.... Hands Free!). I can do that. And a pen/pencil holder is no problem. I'll try to get some pictures posted of these things soon. I have a very small supply of these hats and am not sure that I will get more when they are gone. I've resisted "the hat" for a long time, but a lot of people asked about it, and my youngest son got the ball rolling for me. Low-profile hats are my favorite. 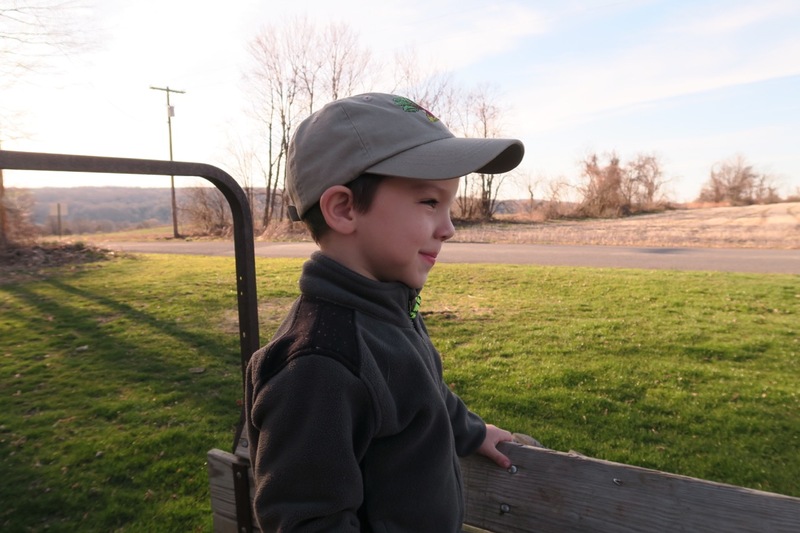 I'm not a fan of the farmer/trucker hats with mesh in back and a large front panel. I've got a big enough noggin as it is without accentuating it with a dome cover that looks more like a bowler than a good working man's cap. I'll be placing an order soon, Herrick, as soon as we have a new credit card number (someone stole our number and made a few charges on it before it got shut down). Ohmygoodness! Future man is so big! 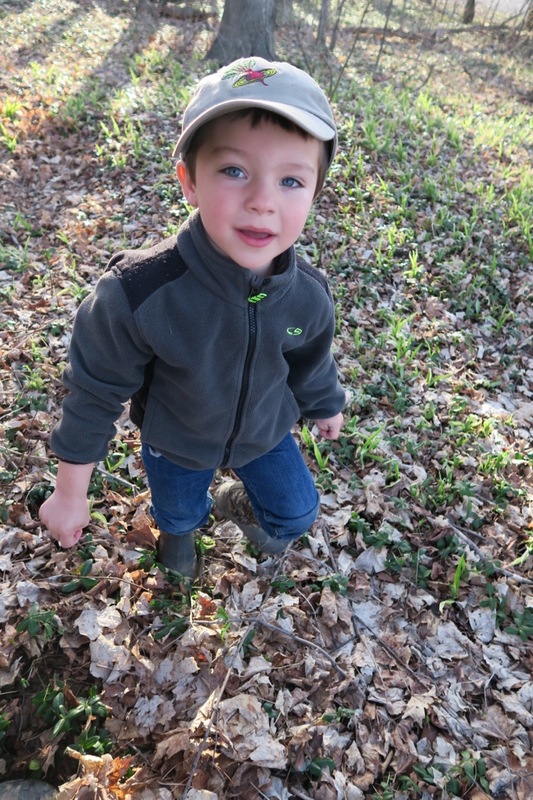 You are a lucky Papa and he's a lucky (and cute) little guy to have you as a role model. I know you and your Mrs. are so proud. Beets! Of all things! Ha! Hi , Just sent you a link over at the Planet Whizbang site. It is for the article in the local paper. Just put on my hat and took a flic, but thought I'd wait till tomorrow and take one more in context! Picture is at Planet Whizbang site. 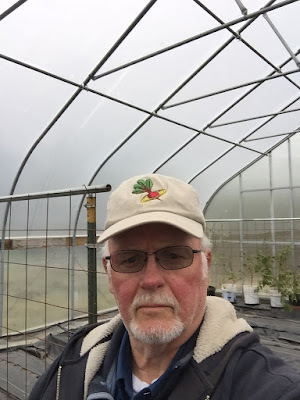 Was in the High Tunnel planting Cabbage, Cauliflower, and Brussel Sprouts when I remembered to send you one.Got the drip irrigation lines run to each row, so now all we need down here is a few straight days of sun! Get one and it rains for two! Guess that will bring us those mythical Spring Flowers! Thanks for the pictures. You're a good sport. I chose the one with the Y-holder and trellis span in the background. The hat looks great on you! Imagine that. 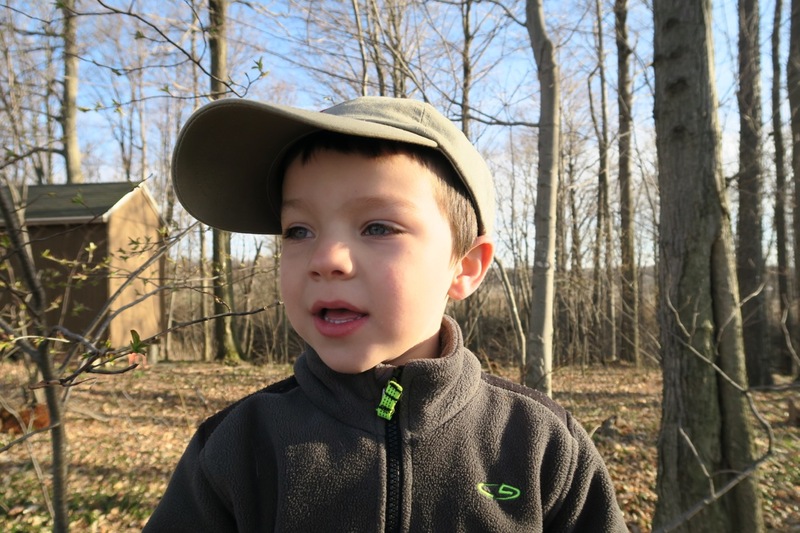 The ladies talk about the little boy, and the men talk about a hat. I was surprised to read Futureman is 4 years old! He's really looking like a little man now. You must be so proud. Your comment section makes me smile and feel good! God bless you and Marlene, grampie and grammie. John D. Wheeler's got a point there! A good suggestion for the next hats!